J Hud has got bars. 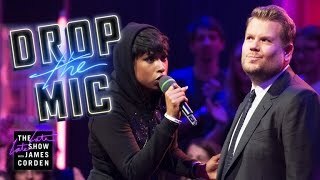 Jennifer Hudson took on James Corden is a hilarious rap battle during a special UK episode of ‘The Late Late Show’. The American singer dropped some vicious lyrics about Corden being disowned by his US audience. "Listen London knows you James that part is true/ I can tell 'cause everyone here already hates you," she rapped. "Your success in America brought us down to our knees/ Singing, 'London, ya'll take this fool back please." She continued with a diss about his weight. “Now no more fat jokes, 'cause it's below the belt/ I mean it though but you can't see it though, just like your p*nis." Corden responded with some hilarious jabs about Hudson’s lack of fame. “You remember J she got famous in the states/ on American Idol for coming in seventh place... You won an Oscar for Dreamgirls I get it/ No one remembers you in that film because Beyoncé's in it." Watch the full rap battle above. Meanwhile, during his special UK episodes of ‘The Late Late Show’, James Corden unleashed his latest episode of Carpool Karaoke alongside Ed Sheeran.